* Listed in New & Noteworthy! 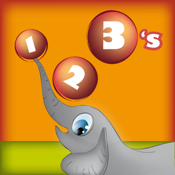 Learn the numbers 1 through 10 with the help of charming animal graphics and audio accompaniment! This app is in an easy-to-use, flashcard form. Each card features the number and animals in action, along with clear American English pronunciation. Once your student has finished flipping through the bright and colorful flashcards, they can even quiz themselves on what they've learned! Try our other children's app and game: Learn your ABC's and Santa Catch!. We would like to hear from you. Email us at support@bluebaymob.com for your feedback and suggestions. Thank you!